To My Guestbook! Please enter your comments under a relevant category. If your category is not listed, place your comment HERE, and I will create a new category. Your e-mail will not show to the public, so if you want to follow comments to yours you may subscribe to the RSS Feed, which is listed at the end of the Comments. If you have a home page, you may enter its URL. Thank you. If you would like others to contact you via e-mail, please enter your address in such a way that it will not be picked up by spammers. For example “jane — at — kmail.com” or something similar. A lovely tribute to an incredible, and pioneering woman! Geri was one of the first women my mom made friends with as a newlywed in 1958 Wallace, Idaho. She worked for Geri’s mother at her “Elder’s” dime store, and they were all members of Holy Trinity Episcopal Church. I am thrilled to see your photos of a woman I love and admire so much. In October of 2005, I brought my mother to visit with Geri & Van Nyman. They hadn’t seen each other in over 30 years, and their reunion was wonderful! I’m overjoyed in finding your album of Geri! your website. It is beautiful and articulate. Keep up good work. It is very interesting. While researching my lineage I came across your a web page, Ancestry of My Grandmother Larkie Bell HACKETT, on your web site. On this page I found a lot of HARRISON’s that are directly related to me. You have a lot more information than I have been able to find. I hope you can help with some of my questions. First off, where did you get all the dates and wifes names and POB, etc? Do you have a family bible with the info? Did you get it off the internet? I am amazed at how much info you have. If you could help me or point me in the right direction I would appreciate it. Next thing is the amount of information you have put into this Web site. You have put alot of time and love into something that the whole world can enjoy. I applaude you. 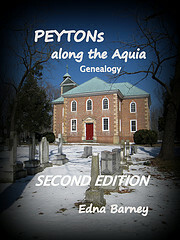 Much of the information on my HARRISON family cames from the work of John P. Alcock, in “Five Generations of the Family of Burr Harrison of Virginia 1650-1800”, 1991. 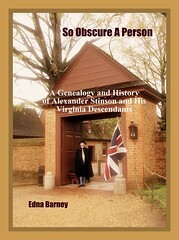 There are also old bible records that are referenced in Alcock’s work and also in Virginia genealogical publications such as “Virginia Magazine of History”. In addition to these sources, I have also found some records in the local county records. Some of the information from the website you mention may also have come from the Internet, as I made that page a long time ago and have not updated it. I have over the last three years been working on my genealogy and always come across your website. I once again found your link to a picture of John Daughtry from google images and as often happens with cyber research linked and searched and found a HUGE missing piece and it was on your flickr site. My Great Gramother was a Ballard, her Great Grandfather was Thomas Medley Ballard. For many many years the location of the old homestead & graveyard was, in my opinion, incorrect. My Great Grandmother died at age 102 and so it seemed the location. I feel I knew Sugar Hollow from maps and three hiking trips to Bucks Elbow. Relatives said the homestead was up the south fork of the Moormans river and there were no ledgible markers left. The Thomas Medley Homestead & graveyard you have pictured? Where is it and can I go there? Is is visable from the road up to the dam? I seem to recall a restored cabin from the route 614. Thank you for all of your work, those pictures have filled a frustrating void for me. You are amazing. Barney family: having grown up in Bladensburg, Md. and now living next to Fredericksburg, VA.,I’m wondering if you are related to the Commodore (Grandfather) Barney of the War of 1812 and Commander Barney (Grandson) U.S.N., later C.S. Navy fame. No Dan – my husband’s family originate with the Barney family of Massachusetts. However, we know a number of the descendants of the Barney family of Maryland, including descendants of Joshua Barney. I found a photo of Joy Naylor Ryckman’s 80th BD taken on 10/18/98 in a book I got at Goodwill, Tallahassee, FL. Also in the photo is Robert Ernest Ryckman, Janice Lynn Ryckman Sheehan, Ronda Joy Ryckman Mace & Mark Stewart Ryckman. Would be glad to send it to a family member who would like it.